What's Going on in Birmingham in January 2018? Check out Our Free Calendar Download! | Infomedia, Inc.
What’s Going on in Birmingham in January 2018? Check out Our Free Calendar Download! 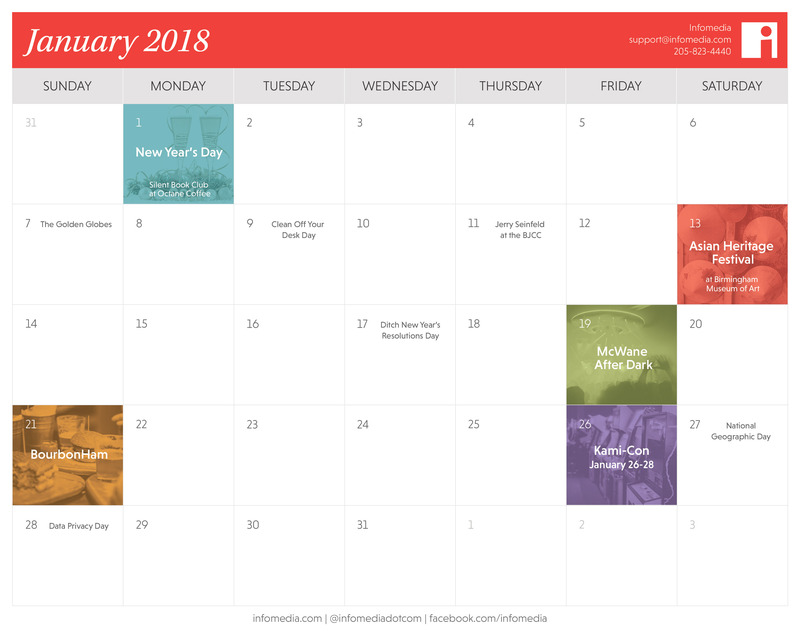 If you’ve resolved to makeover your social media and content strategy, our free calendar download can get your year off to a great start. There’s no time like the new year to begin some productive new habits, not only personally but professionally. So if you’re starting a blog from scratch or shaping up your social media strategy, our calendar download can help guide your efforts. From cultural events to local fun, there’s a little something for everyone to enjoy. Cozy up with a good book and a hot cup of coffee at Octane Coffee’s Silent Book Club on January 1. Looking for laughs? Take in Jerry Seinfeld at the BJCC on January 11. If anime is more your thing, Kami-Con heads to Birmingham on January 21. Also not to be missed are the McWane Center’s McWane After Dark: Party Like its 1998 on January 19. If you consider yourself a bourbon aficionado, you’ll want to mark your calendar for BourbonHam on January 21. The event, which is Birmingham’s premiere Bourbon and BBQ fundraising event for the National MS Society, will feature over 50 different bourbons and whiskeys. Plus attendees can catch the AFC and NFC playoffs during the event. We love our silly holidays at Infomedia, and there are quite a few you can use to jazz up your office culture. Catch Clean Off Your Desk Day on January 9, ditch your resolutions on January 17, and celebrate National Geographic Day on January 27. We’d be remiss not to mention Data Privacy Day is January 28 — so clean up your passwords and consider updating your site’s SSL. Download our free calendar today. Journalist and blogger Alexis Barton has loved language and the written word for as long as she can remember; she earned her Masters in Journalism from the University of Alabama before joining us here at Infomedia where she puts her skills to work researching, interviewing and writing web copy for our clients, our own blog and our social media channels. She might be a self-described “grammar nerd,” but she promises she isn’t judging your texts, emails or emoji usage. When she isn’t at the keyboard, Alexis loves shopping, napping and obsessing over Alabama football.